Sterling Systems & Controls offers a customized process control and automation system for grinding and classifying. The company can customize, automate, and complete the conversion of your raw material to multiple finished products through grinding and classifying. “Grinding,” “milling,” and “classifying” are terms that are sometimes used interchangeably because in recent years the differences have blurred. In any case, the challenge for process control & automation of the grinding and classifying process is to monitor and control multiple pieces of process equipment and to automate this with minimal, if any, human intervention. This could be for milling grains to produce feed or foodstuffs, chemicals and minerals, pharmaceutical applications, and more. The company provides upfront design engineering assistance from process to automation. Engineering and equipment are provided including electrical controls, classifying/grinding mill monitoring for safety and maintenance, sensors, and a PLC/PanelView -based automation system. These control and automation systems can also include formulation and setpoint data storage, live data trending, and historical data collection. 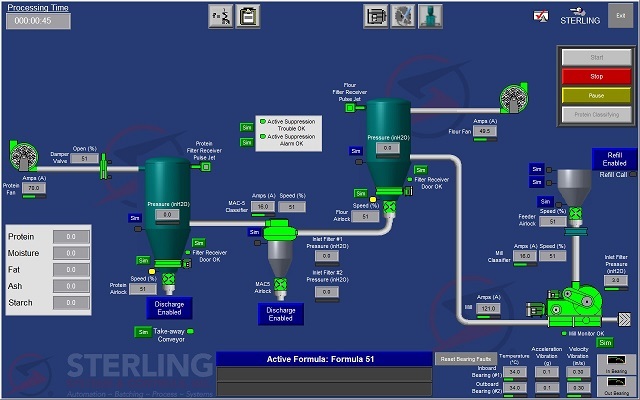 In the grain processing area, for food ingredients and materials, Sterling Systems has repeatedly provided design engineering, electrical controls, and automation to transform a whole grain into multiple products such as flour, starch, protein etc. In this example the company used a PLC/PanelView running a custom designed FactoryTalk View ME application. In addition, it engineered and provided the electrical controls and electrical equipment for the grinding and air classifying mills, and also the grinding mill monitor control panel.